Wang Zhaoguo, member of the Political Bureau of the Communist Party of China (CPC) Central Committee, said Friday that the CPC is ready to further relations with the New Zealand National Party. Wang, also vice-chairman of the Standing Committee of the Chinese National People's Congress, said in a meeting with Don Brash, leader of the National Party, that the two nations have maintained good relations since forging diplomatic ties, and the CPC values its relations with the National Party. Further enhancing the exchanges and cooperation between the two parties will help promote the friendly and cooperative ties between the two states and two peoples, he said. 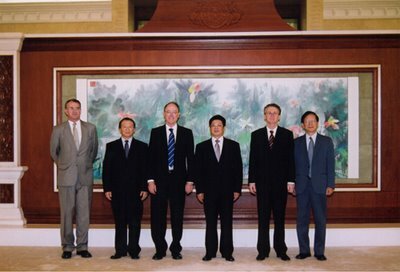 Wang Jiarui, Minister of the International Department of the Communist Party of China Central Committee met with Don Brash at the same day. Wang expressed his welcome to Dr Brash, who made the visit to China as his first foreign tour since he was elected party leader. The two sides agreed on expanding exchange and cooperation between China and New Zealand and making join efforts to advance bilateral relations. They also exchanged views on cooperation in education, culture, economy and trade. It looks like Brash is trying to get campaign funding from a brutal military dictatorship in exchange for selling NZ out to them. He failed to get it from the Bush administration because NZ is already in the pockets of US big business. Brash said his party adheres to the one-China policy, advocates closer bilateral ties, and supports an earlier agreement on a freetrade agreement between the two countries. No matter which party is in power, there will be no change in New Zealand's policy to develop relations with China, he said. I guess this means "not offending" China either way (i.e. not speaking out against any of the Chinese government's actions). If the ACT MPs were to speak out against Labour and National's attitude towards the China, then maybe more Taiwanese immigrants would vote ACT. In addition; if ACT renounced the state asset sales during the 80s and 90s (but maintain the view that all other reforms were worth while including the corporatisations) and have a no privatisation bottom line for C&S agreements, then maybe they could attract the nationalists away from NZ First without diminishing ACTs current base. Why doesn't ACT take a public stand against the torture and suppression carried out by the CCP? The Greens do, for goodness sake, and ACT is supposed to be the party of freedom! Act a party of freedom? Act would rather get tough on crime than just on crime.